Every once in awhile (actually more than once in awhile ever since I’ve worked on becoming more present in “the moment” I am in), I find I learn things just by watching or listening to others — whether it is something a person will say in conversation or in passing, or while observing the actions of another. A few days ago I drove my daughter Jackie to the oral surgeon’s office to have all four of her wisdom teeth surgically removed. It was her decision to have the procedure, as she was experiencing pain from her teeth. I was prepared to take care of whatever she needed for the procedure and recovery. We arrived at the oral surgeon’s office and a paperwork issue caused a delay in starting the procedure. I should mention that Jackie was absolutely mentally and physically prepared for the surgery. She had NO fear or reservations about it in any way. Actually, she was even excited about it. I’ve spoken to others who also were excited to have procedures done expecting the pain following the surgeries to be less than what they were experiencing currently. She was in that frame of mind. When the dentist’s office noted that they may have to reschedule, she matter-of-factly stated that that was not even an option and that she was there to have her teeth removed. At that, they proceeded to do the extraction. She came through with flying colors, like she just went in for a regular cleaning — totally fine, ready to go home. She tackled her recovery in the same manner – like it was “no big deal”. She took her antibiotic, ate mushy food that she chose and, for the most part, cooked herself. She got her own ice packs when she needed them… She absolutely took care of her own business. There was no pity party here, no attitude of “woe is me”. I was amazed at her positive, strong, no issue Attitude. In retrospect, I believe that if she had been fearful about the procedure or had a different expectation about her recovery she would not have had the same experience. As a matter of fact, that same evening she even took a shower and went to a wake of a friend who had passed away. She had been totally determined to go, and she did. Watching her and observing her Attitude and actions brought me to writing this article. I believe Attitude and a positive outlook are probably the most important mindsets we need to be aware off within our day… every day. Hey, I’m certainly not perfect. We’re all human. I get tired or overwhelmed at times. I also tend to over-think things and create scenarios and “what ifs”. Jackie had no “what ifs” in her experience. She just went with the flow. My current daily goals include striving to be positive and to have the best Attitude possible. My goal, and the goal of my family who constantly remind me if my behavior shifts otherwise, is to become aware of an Attitude shift as soon as possible. Becoming aware of an undesirable behavior allows me to stop, reevaluate the situation or experience I am facing, and make a change in my behavior; a change for the better so I can enjoy my day and my life. Having a good Attitude is work on my part! But I’ve definitely acknowledged that my life is so much better without the old “doom and gloom” going on. And, I believe that having a positive Attitude sure beats the alternative, which may include feeling poorly, down, sad and/or depressed. Let’s just review the definition for a moment: “A settled way of thinking or feeling about someone or something, typically one that is reflected in a person’s behavior” – it’s all right there. What we think may directly affect our behavior. What we feel may directly affect our behavior. I don’t know about you, but the main goal I have every day is just to have a nice day. At the end of the day, I want to get into bed each night with a smile and knowing that I had a great day — every day. If what we think or what we feel is not positive and proactive, if what we think or what we feel makes us feel sad or bad, then, hopefully, we have an ability to make some sort of a change in our day or in our lives in order to feel differently, and, hopefully, better. Think about the second part of the definition of Attitude for a moment. “A position of the body proper to or implying an action or mental state.” This part of the definition really tells me how what we think or what we feel not only comes out in our mental state and behavior, but in our body mechanics. How do you feel when you have a bad Attitude — when something is bothering you? I believe it does come out in our bodies – in our posture and/or in pain like a headache or backache. Our Attitude affects more than just our behavior. 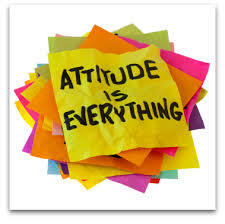 Our attitude also affects our health – positively or negatively. Life is not always a bowl of cherries. Last night I had an opportunity to see someone I hadn’t seen in years. He was working two full time jobs and was so exhausted. He had the hopes to move out of State in a few years to retire. I asked him what would make him keep going in a displeasing situation and wait for “someday”. Certainly I have realized, over and over, that we stop objectively seeing what is going on around us and to us. Sometimes we become almost like robots in our actions and our lives. Many people live “on the hamster wheel” not enjoying life, but dealing with life and not really living. What is your daily Attitude? Is it one of positivity, or one of frustration and stress? Do you wake each day ready to conquer the world, knowing it’s going to be a great day, with a smile on your face? Or do you start each day dreading the situation where you are in life and just “existing”? Even if things aren’t perfect in our lives, our Attitude can make things so much better. We’ve heard the stories of the people who have survived less than ideal situations in their lives because of their Attitude and how they knew they were going to make it through. Their positive outlook got them there. Today, perhaps, do an Attitude check, and don’t forget to take a moment to smile. It’s time to Enjoy YOUR Life. It’s Time to Play. Let Us Help You Dream and Plan Your Bucket List Destination for 2014! Can Food Intolerance Cause Behavior Issues in Children? What's Your Excuse?